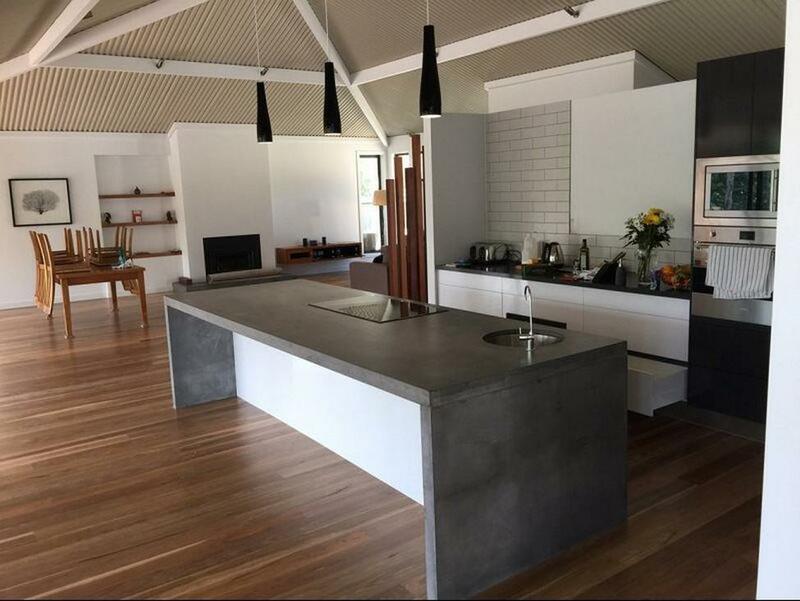 FeastHome – Concrete material is a very strong material which is really suitable to be used as a countertop. As we know, most kitchen sets and kitchen utensils are made from hard materials. 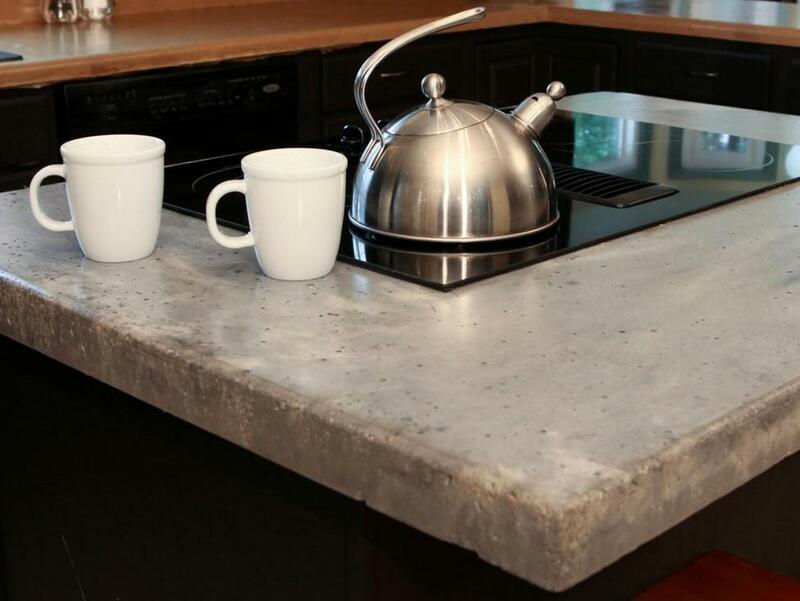 A concrete countertop is very durable and it is also resistant to heat. Moreover, this material is also able to be made with various designs. 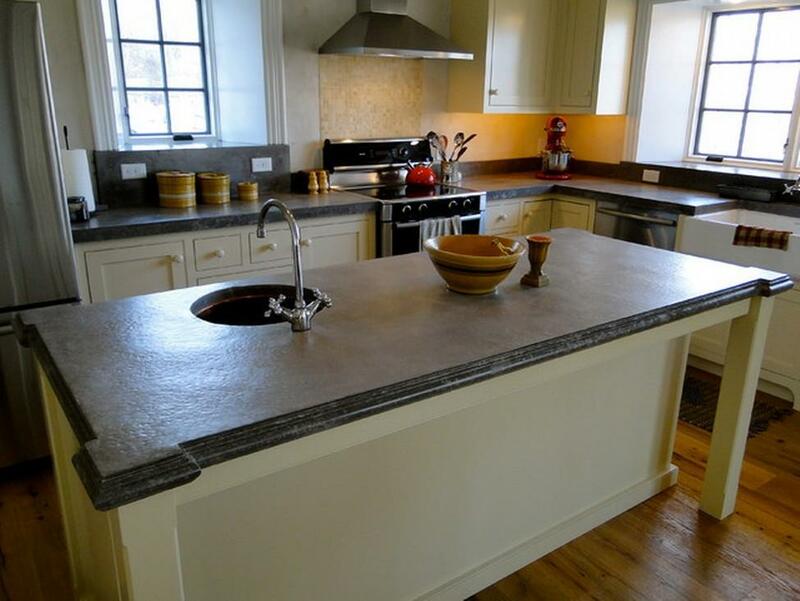 Below are the ideas of concrete countertops for you who are looking for several inspirations. 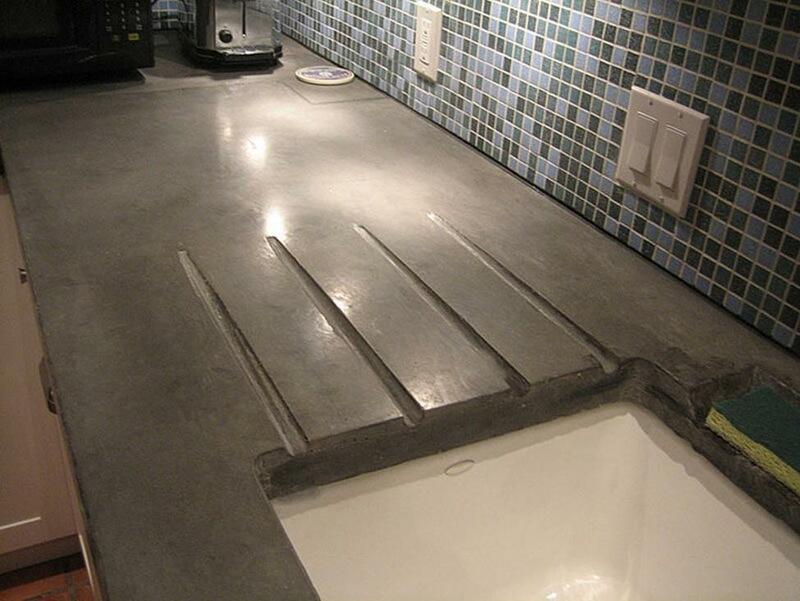 By maintaining the original look of the concrete material, this kitchen has a stylish industrial look. Added by the wooden floor and wooden dining table and dining chairs, the industrial look becomes even stronger. The dark grey tone from the concrete countertop blends very well with the warm and natural brown tone from the wood material. The householders maintain the natural pattern of the wood, a smart idea to instantly have a patterned floor. The spacious area of the concrete countertop is only filled with the sink and built-in stove, making it looks very neat and simple. A concrete material has pores, just like you can see in the picture above. You are able to use this material as it is for your countertop if you want a natural touch in your kitchen. But if you want your concrete countertop to be more durable, you have to polish it. 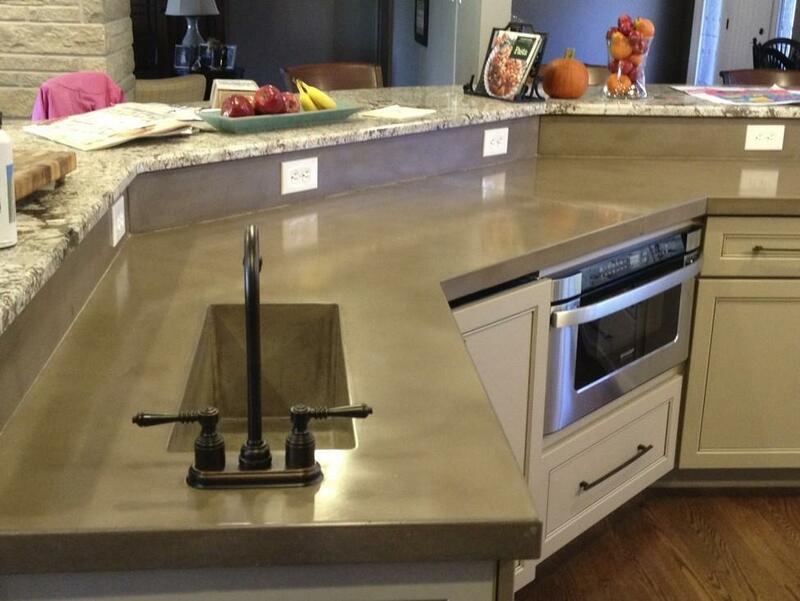 By polishing the concrete countertop, you will be able to have a durable and shiny concrete countertop in your kitchen. A pattern does not always have to be plaid, stripe, floral, or anything. By adding some scratches or lines in a concrete countertop, you can directly have a patterned concrete countertop. This idea is very suitable for you who want an anti-mainstream and unique concrete countertop. The natural grey color from the concrete material matches beautifully with the blue patterned kitchen wall. The concrete countertop above is also designed to have a place for the sponge. Only 2 words to describe this kitchen with concrete countertop: very natural. 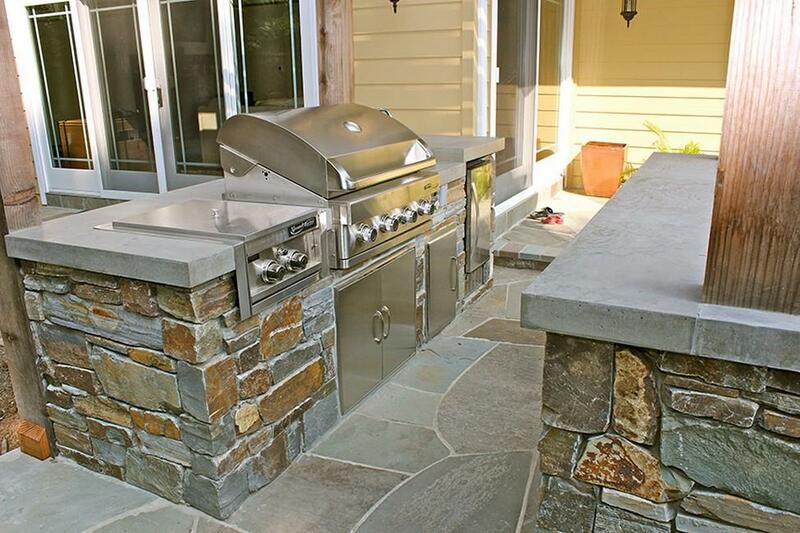 This kitchen idea is very suitable for an outside kitchen or open kitchen. The natural bricks as the cantilever blend very perfectly with the concrete countertop. The stainless steel kitchen utensils even match with other elements. Moreover, the wooden pillar is used in order to strongly maintained the natural style. For you who love to hold a barbecue party at your house, you should try this idea. This concrete countertop has an unfinished look that is suitable for you who want to have an industrial style in your kitchen. Look at the plaid kitchen walls, accentuate the industrial style. 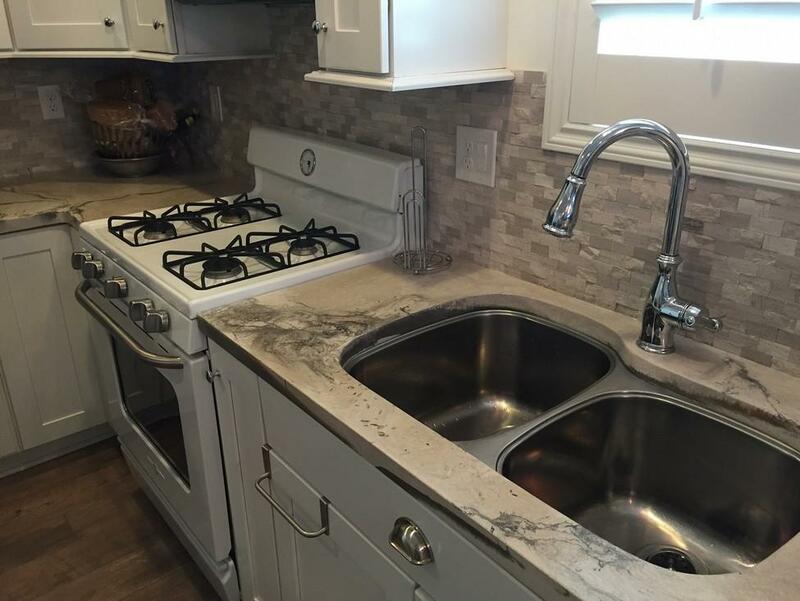 The sink is even in the same material, making it looks like a part of the countertop. The householders use a stainless steel faucet so that it unites with the grey concrete countertop. In order to add colors, the wooden windows are used. 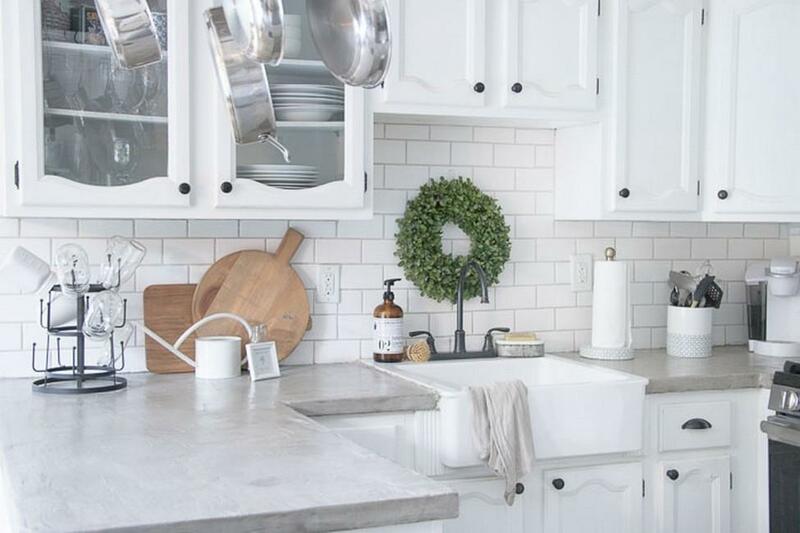 The artsy pattern of the concrete countertop matches very well with the brick kitchen walls. Moreover, the brick kitchen walls make the kitchen looks less boring. The householders use a light tone from the concrete material so that it blends harmoniously with the white stove and white kitchen cabinets. A concrete material is available in various natural colors so that you do not have to be worried about choosing one which is suitable with other elements in your kitchen. This kitchen looks very clean and bright because of the white color that dominates the area, combined with the light grey tone from the concrete countertop. If it is hard for you to find the light grey tone of the concrete material just like the picture above, you are able to polish the concrete countertop in order to get the colors you wish. By polishing the concrete countertop, it will have other colors besides its natural color and also make it more durable and shinier. As it has been already mentioned before, you are able to have a shiny countertop in your kitchen by getting it polished. A shiny concrete countertop is really suitable for you who want to bring an elegant touch to your kitchen. Just like the picture above, the shiny concrete countertop can even reflect the shadow of the electric plugs. The use of marble dining table is a perfect idea in order to create a modern style in this kitchen. And look at the faucet, it is very classic and unique, making the kitchen area looks more artsier. As it is already stated above, a concrete material is able to be made with various design. If you are bored with the straight rectangle or square concrete countertop, you can have one with some curves just like this idea. The curves make the concrete countertop looks less boring. The dark grey concrete countertop blends perfectly with the white cabinets and stainless steel stove. Moreover, adding the French windows is a great idea to make the kitchen area looks larger and allows the natural sunlight coming through. If you want to have a modern look kitchen with a concrete countertop, you can follow this idea. 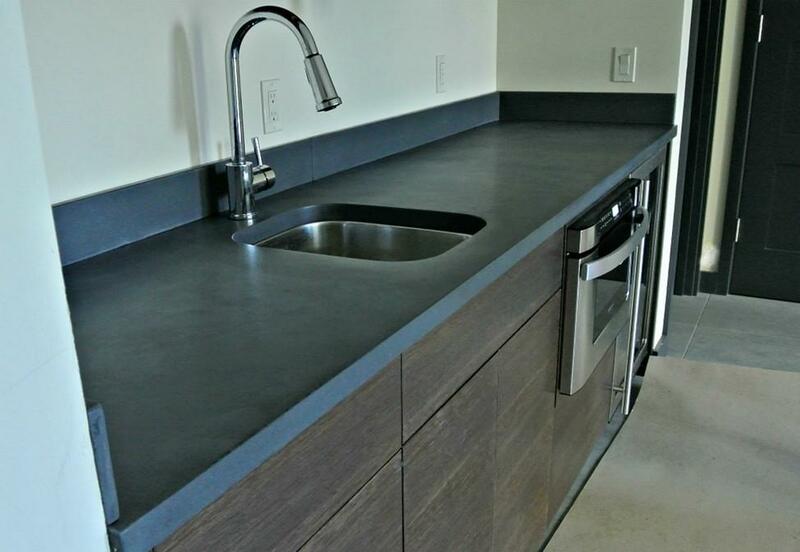 The concrete countertop looks very solid because it is polished with a matte polish. The dark grey tone from the concrete countertop and dark brown from the wooden kitchen cabinets strongly bring the modern theme to this kitchen. This idea is very suitable for a house in a metropolitan city. The stainless steel faucet is chosen in order to maintain the modern look. 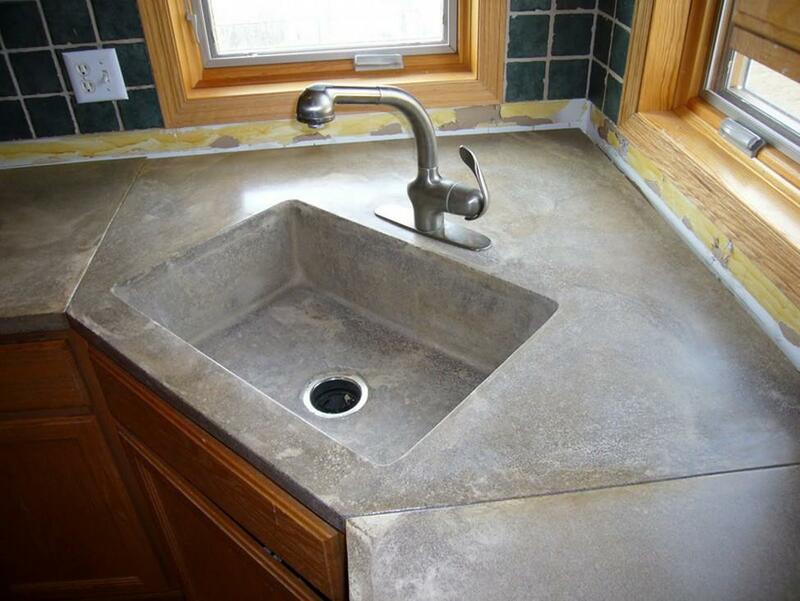 Basically, a concrete material is already widely used as a countertop. This material is cold and absorbing heat. So that you do not have to be worried about placing a hot pan on top of it. But because this material is heavy, you have to use a strong cantilever to support it.